The wheels and gears of Tim Eyman’s initiative factory are once again being lubricated with piles of money from greedy multinational oil companies, newly updated Public Disclosure Commission records show. Minutes ago, Tim Eyman’s treasurer uploaded campaign finance reports for the latest incarnation of Eyman’s “Voters Want More Choices” committee for the month of April, which is serving as the repository for the money Eyman is raising for I-1185, his latest destructive initiative, which is essentially a carbon copy of I-1053 from two years ago. 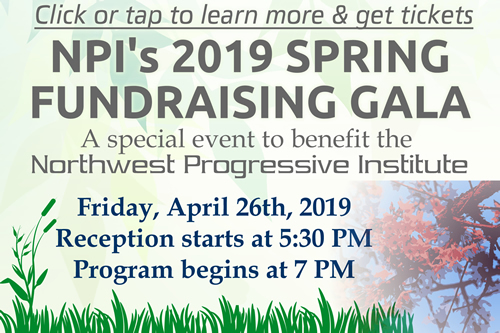 Of the $247,285.59 raised for I-1185, more than eighty percent – $200,000 – came from BP and ConocoPhillips, which sent Eyman matching checks dated April 11th and April 30th, respectively. This isn’t the first time BP or ConocoPhillips have contributed to Eyman’s initiative factory. As regular readers no doubt remember, both companies were big donors to I-1053 two years ago, and prior to their just-revealed April contributions, they were already among Eyman’s top ten all time wealthy benefactors. As a result of its April 11th contribution, BP has now moved into the fifth spot on the all-time wealthy benefactors list, ahead of deceased helicopter logging magnate Wes Lematta. And ConocoPhillips has now gone from being tied for ninth place in the rankings to seventh place with its own $100,000 check. Eyman has already funnelled some of his new oil money into the coffers of his friends Roy Ruffino and Eddie Agrazarm, who run “Citizen Solutions”, the firm that has brought in most of the signatures for all of Eyman’s recent initiatives. In fact, the very same day that BP’s check arrived (April 11th), Eyman wrote a check for an identical amount to Citizen Solutions, records show. If history is any indication, contributions from other corporations are sure to follow. Eyman doesn’t have to report what he hauls in for the month of May until June 10th. That’s several weeks from now. Back in January, Eyman told his followers that he and his cohorts – Mike and Jack Fagan of Spokane – hadn’t decided what their initiative would be for 2012. We interpreted that announcement (or non-announcement) to mean that Eyman didn’t have money lined up to do a signature drive. But evidently he had some conversations with powerful lobbyists as the year wore on, and secured a financial commitment from BP to launch I-1185. We have long said that anyone willing to put up half a million dollars to run an initiative can buy themselves a spot on the ballot. BP and ConocoPhillips alone could make sure that Eyman’s I-1185 qualifies by sending the Mukilteo profiteer a few more checks. It’s possible they already have sent Eyman more money and we don’t know it yet. For the last few weeks, we’ve been gearing up to fight I-1185, operating under the assumption that Eyman had the money to buy the signatures he needed to get it on the ballot. It’s clear that our assessment of the danger was spot-on. Now we must shift into higher gear. Washington simply cannot afford for Eyman’s unconstitutional, undemocratic “two thirds for tax increases” scheme to remain in place. It’s choking our common wealth and the public services our common wealth pays for. We at NPI will do all we can to defeat I-1185. But we’re going to need your help. This is going to be an extremely difficult battle. But we can’t afford not to fight. Nothing less than Washington’s economic security is at stake. We have to stop Tim Eyman and the powerful interests that are using him as a puppet from winning. We have to protect our state’s future. I wanted to submit this comment directly to the author, but since I can’t seem to do that, I’m just going to post it here. This article would be much clearer if you gave a little information about I-1185, or at least a link to where you are finding your information about the initiative. A quick online search yielded nothing. You say it is “essentially a carbon copy of I-1053,” but I thought I-1053 was passed, and even though it was challenged, the internet tells me that it was upheld. Why would Eyman propose another nearly identical initiative if the outcome of I-1053 is still in effect? I am thoroughly confused. I don’t regularly follow your blog, but scanning headlines back to the beginning of the year also provided me with no context for this blog post. Kelly, we don’t have a ruling yet on the legal challenge that’s been filed against I-1053. The initiative has *not* been upheld, nor has it been struck down. The text of I-1185 is available on the Secretary of State’s website. If you look through it and compare it to the text of I-1053, you can see the two measures are almost identical. There’s not much that’s different. The reason Eyman is doing I-1185 is that after this December, it will become possible for the Legislature to suspend or amend I-1053 by majority vote. The Constitution says initiatives can’t be changed within two years of passage unless two-thirds of the Legislature agrees to make a change. By replacing I-1185 with I-1053, Eyman hopes to start the constitutional clock over and keep his undemocratic scheme in place for another two years. It’s both sad and ironic that Eyman is using our state’s Constitution to keep his Constitution-sabotaging scheme in place. It would be helpful when you talk about initiatives that you include at least a one-sentence description of what the initiatives are about. Giving a number doesn’t help those of us who are [lazy and] not as politically geeky as others! Thanks. So, what does “I-1185” propose to do? Most people don’t know the half of it. Paid signature gatherers our being required to work on both Eyman initiatives. The money behind I-1185 should not support Tim’s other initiative. © 2019 The Northwest Progressive Institute. The Cascadia Advocate loaded in 0.138 seconds.